Thought we’d show you what swims in Blackfoot Reservoir in Idaho, where the soon to be held Fin Chasers Carp Classic occurs. This pig, a 30-pounder, was taken by Travis Morris during last year’s two-day fly-fishing tournament. Big as it was, the overall winner was a 33-pound behemoth that was landed by Robert Jenny. Get in on the fun this year, beginning May 18. 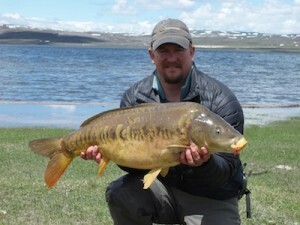 This entry was posted in Culture, Idaho, Industry, Warmwater and tagged carp. Bookmark the permalink.